Blackout, Dimout, Roller, Venetian, Romans, Laminated, Pleated, Verticals and Panel, blinds – Curtains and Port Bungs. Blinds, blinds, blinds, curtains and bungs! 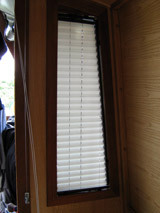 All our blinds and curtains are made to measure to give your window dressings that bespoke look. With a wide choice of slat widths and over one hundred colours our range of aluminium Venetian blinds provide tidiness (the blinds are held against the cabinside with side guide wires) along with privacy. Our range of standard roller blinds with a wide choice of colours and finishes is now complemented with the recently introduced ‘Glide’ system which gives a controlled rewind action when the blind is released. 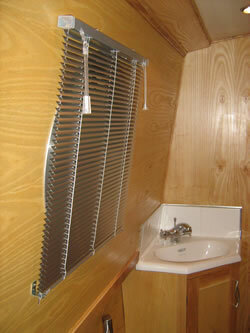 Bulkhead windows are always a problem, we can now supply pleated blinds for both square and shaped windows. These can be face or reveal fitted, look extremely smart and add a new dimension to your bespoke window dressings. Traditional curtains are catered for and we can supply these with or without linings, rails poles, fiddle rails in fact the choice is endless. For port holes we can supply bungs either from our stock fabrics or maybe from a choice of your own materials.